Healthcare Industry Barcode Label Maker Software designs and creates Health care industry useful barcode labels. Health care barcode label maker produces barcode labels useful in Hospitals, Pharmacy for labeling medical equipment, medicines and other similar barcode labeler needs. Bar code software is useful to produce custom type barcode label of invariant size, font and shape to label healthcare equipments, healthcare tools, healthcare prescription, medical bills and to identify patient via bar-coded wristbands. Healthcare industry barcode label maker product. 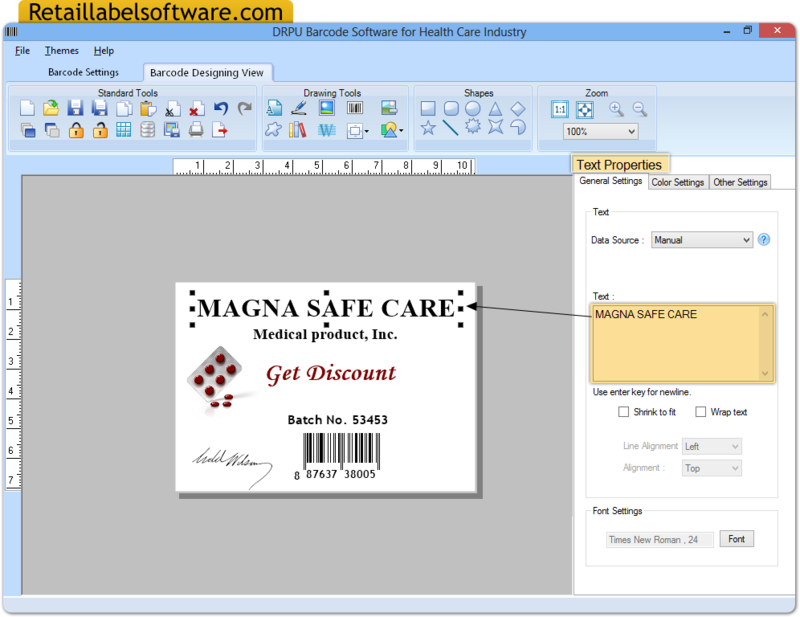 Software supports major Linear and 2D barcode fonts. Barcode generator software provides option to design barcode images. Provide flexible print settings while printing barcode labels using label printing software. Save designed barcodes images on PC in different file formats. Provides advanced barcode system for barcode label creation process.